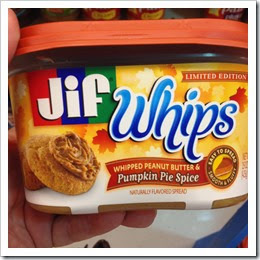 While shopping today, I noticed this at the store- Jif Whips, pumpkin spice flavored. I like peanut butter, and the whipped stuff is a weird texture, but still good, but pumpkin spice? Really? Is this a good idea? And I didn’t buy it- darn it. It might be good, and if not, I can give it to my sister, Allison who tires freaky food all the time. Consider payback for the Turkey flavored soda she made me drink one year, or the Pickle Juice popsicle she insisted was lemonade. But this Pumpkin Spice is spreading, like an infection…. I found Pumpkin Spice pop tarts, which intrigues me. At least its pie, right? Pumpkin Spice M&M’s? Hmm. That might be tasty too. But in all seriousness, I do like Pumpkin Spice. And if you use canned pumpkin, it adds not just flavor but healthy Vitamin A. I’ve made Pumpkin Spice muffins before which was so easy and tasty- just cake mix and a can of pumpkin. So tasty. My husband tells me he’s planted cooking pumpkins in the garden, so this Fall we’ll have organic, fresh, grown with love pumpkin spice ….whatever we want.